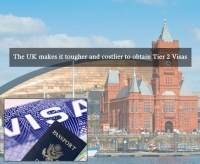 The Home Office, United Kingdom had announced major changes in the visa fees last year. The tougher and more expensive visa rules were implemented from 6th April 2017. The reformed visa fee will be affecting the Indians along with nationals visiting the UK from outside European Union (EU) nations. As per an official statement released by the Home office; "Set at 1,000 pounds per employee per year, and a reduced rate of 364 pounds for small or charitable organisations, it (Immigration Skills Charge) is designed to cut down on the number of businesses taking on migrant workers and incentivize training British staff to fill those jobs." The home office has stated that an exemption for the revised charges will be given to the candidates applying to the PhD-level jobs and overseas students who are willing to switch their student visas to work visa. This exemption has been done with an intention to retain the talented personnel’s and scholars who can help the British economy to grow. Most of the changes were announced for the Tier 2 category visas, as these were the ones used majorly by the majority of Indians and other nationals belonging to non-European countries. It is also assumed that these changes will reduce the number of immigrants coming to the United Kingdom from outside the European Union nations and will lead to tightening the visa regulations. Off lately the government of United Kingdom declared that professionals including teachers, nurses and social workers from countries like India, applying for the Tier 2 visa in order to live and work in the United Kingdom will require to attach a certificate from the concerned authorities from their home country with their visa applications. The certificate will disclose whether the visa applicants are having any criminal record or not. The applicants need to provide a police clearance certificate from all the countries where they have stayed in for more than a year in last 10 years.